In January of 1936 in Schuylkill County, Pennsylvania, a small committee met to discuss the possibility of starting an organization to support local charities. Known then as the Community Chest, Schuylkill County residents donated generously and the first campaign raised $72,000 [2017 value: $1,261,828] to help support numerous local agencies that offered human services at little or no cost. 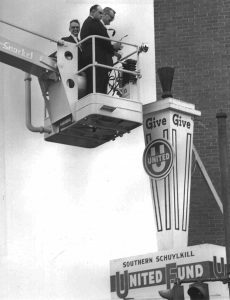 In the early 1970s, the Community Chest became an independent member organization of United Way Worldwide, and was renamed the Schuylkill United Way. Governed by a Board of Directors made up of local leaders, the Schuylkill United Way has raised and distributed over $28 million back to the community. Schuylkill United Way currently supports 14 Partner Agencies that are located throughout Schuylkill County. Partner Agency services are free or available at minimal charge to community members in need. Today, the Schuylkill United Way staff comprises an Executive Director, Director of Community Relations and an Administrative Director. Members of our Board of Directors either live or work here in Schuylkill County. The Schuylkill United Way serves as the local administrator for the FEMA program which provides funds to supplement and extend current available resources for emergency needs including rent, food, and energy assistance. Schuylkill County Complete Count Committee (U.S. Census Bureau), State Employee Combined Appeal (SECA), United Way of Pennsylvania Public Policy Committee, PA 2-1-1 East, Schuylkill Chamber of Commerce Nonprofit Committee and Pennsylvania Association of Nonprofit Organizations (PANO). The FamilyWize Prescription Discount Card (familywize.org) is available to anyone who does not currently have prescription coverage. The average savings in Schuylkill County are typically 40% off the cost of prescriptions. FamilyWize Prescription Drug Discount Card.